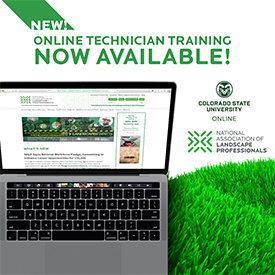 Three online training classes for your technicians focused on maintenance, installation and irrigation are now open. They are self-paced, online courses that can be taken from the comfort of your own facility or home. You can purchase classes separately or all together. Classes include videos, interactive diagrams and quizzes. The online classes help prepare technicians for the Landscape Industry Certified Technician Exam. AND they can be used for the educational requirement for the new Landscape Management Apprenticeship Program.